It was inevitable. Nvidia's Pascal architecture was introduced to the world in the form of the Tesla P100, so it was already clear that big chip Pascal would find its way into consumer hands eventually. That said, the announcement last month of the new Titan X, which acts as a direct replacement for the previous Maxwell-based GeForce GTX Titan X, did come pretty much out of the blue and took us a little by surprise. With this product, Nvidia has opened up an even wider gap between itself and rival AMD in the high-end GPU market, not just in performance but efficiency as well. This is great news for Nvidia, as it has a niche but highly lucrative segment of the market all to itself. As a result, it can effectively charge whatever it wants, and the £1,100 price tag of the new Titan X reveals that it is doing just that. If, like us, you're at all concerned with value for money, this isn't going to be your next upgrade. However, that's never been what the Titan family is about, and there's certainly no reason for that to change now. 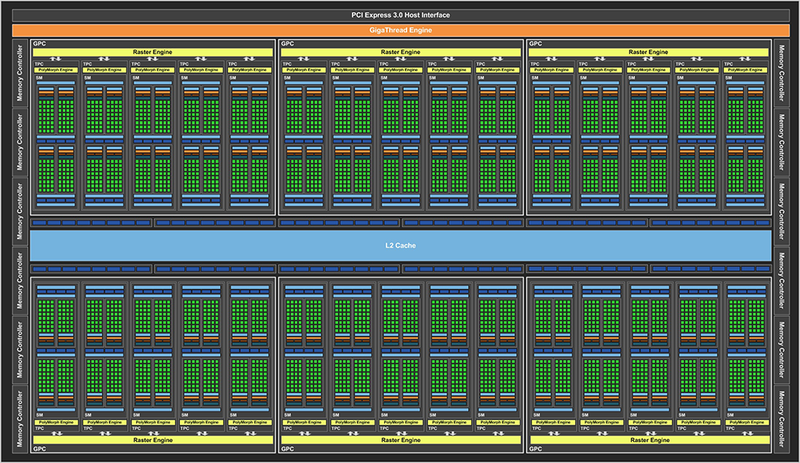 The Pascal variant of the Titan X is built around a new GPU, GP102, which is effectively the GP104 GPU used in the GTX 1080 scaled up by 50 percent. As such, we move from a layout of four Graphics Processing Clusters (GPCs) and 20 Streaming Multiprocessors (SMs) to six GPCs and 30 SMs. However, even Titan X is not using a fully enabled GP100, presumably because fully enabled yields were too low. Instead, two of the SMs are disabled, leaving us with 28, and thus texture unit and CUDA core counts of 224 and 3,584 respectively; a sixth more than the previous Maxwell-based GTX Titan X and 40 percent more than a GTX 1080. With this GPU, Nvidia is able to deliver up to 11 TFLOPs of power, more than any seen before in the consumer market. An astounding 12 billion transistors make up the GP102 GPU, which is 50 percent more than the Maxwell Titan X has yet thanks to the move to a 16nm FinFET process, the die size is actually down by over 20 percent to 471mm2. Nvidia has also been able to ramp up the clock speeds considerably thanks to Pascal's transistor-level improvements: the base clock is up by over 40 percent, now sitting at 1,417MHz, while the boost clock is rated at 1,531MHz. This is still a fair way behind the GTX 1080, however, and even further behind typical overclocked, third-party variants of said card. While the Tesla P100 uses HBM2 memory, for Titan X Nvidia is back with GDDR5X, first introduced with the GTX 1080. Here, you get a whopping 12GB frame buffer and it's running at the same effective speed of 10Gbps. The 384-bit memory interface from the GTX Titan X (Maxwell) has been carried over, meaning we're looking at a memory bandwidth of 480GB/sec. In raw terms, this is an uplift of more than 40 percent over the Maxwell Titan X, but as a Pascal part the new card also benefits from fourth generation delta colour compression, meaning that on average the gap should be even bigger. 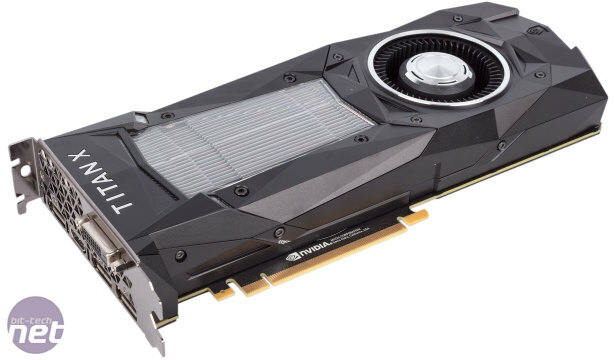 Nvidia says the new Titan X was planned to run with GDDR5X all along rather than HBM2, and that with its compression technology and the raw speed here GDDR5X offers enough bandwidth to feed the massive GPU. 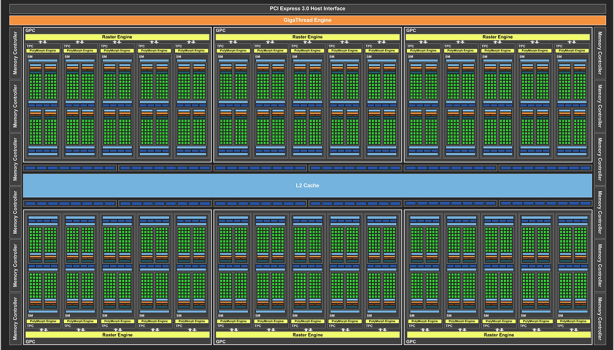 As has been the case with Titan cards for some time now, FP64 performance is not accelerated and the Titan X is not marketed as a compute card – Nvidia will point you to its Tesla P100 for such things now. 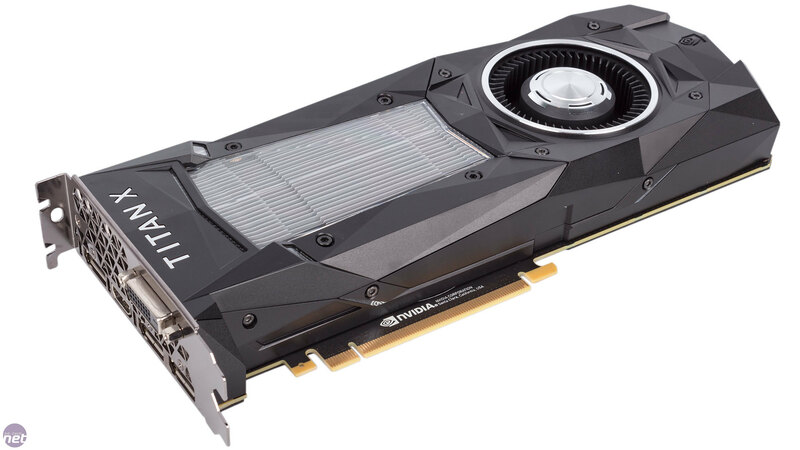 This is primarily a gaming card, then, although Nvidia has now dropped the GeForce GTX branding from the Titan X to indicate some sort of separation between it and its 'normal' gaming cards, while retaining the Titan X name from the last generation to suggest consistency in it being the ultimate card. Aren't product names fun? In the UK and US markets, Nvidia is limiting availability of the standalone Titan X to its own web-store, although select etailers will have stock in those countries where the web-store isn't available. As usual, it's only available with the Nvidia-designed cooler, although the usual suspects were quick to announce their third-party water blocks for anyone interested in water-cooling. Nvidia yet again beats its own records with the new fastest GPU on the block.